Ultrasonically Sealed Edges: Actifil Pocket Filter Media is ultrasonically sealed on both edges for maximum burst strength and no-bypass performance. Your company logo may be embossed along the edges to enhance the aesthetics and marketing value of the filter. Ultrasonically Welded Spacer: Six strips of high strength spun bond nonwoven are continuously welded inside the pockets. These spacers prevent adjacent pockets from obstructing one another due to over-expansion. An initial layer of thin gauge spunbond material protects the structural integrity of subsequent layers from wind shear. It also deflects airflow and reduces particle momentum for maximum filtration performance. 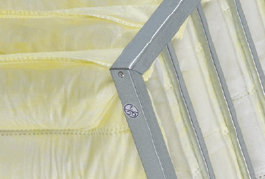 Electrostatically charged polypropylene fleece captures most dust particulates in the airflow. This loosely structured layer provides exceptional depth loading, optimizing dust-holding capacity. 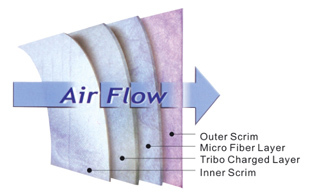 A micro fiber melt-blown nonwoven layer captures remaining dust particles in the airflow.Â This high efficiency mechanical filter media is strategically placed downstream of the needle punched layer; the two provide complementary performance. A color-coded scrim is the external layer of the composite media. This high strength spun bond nonwoven contributes strength to the composite media. Its color provides a visual differentiation for different filtration efficiencies. Coloration may be tailored to individual customer preferences.